The second-ever female Brazilian JiuJitsu black belt in Norway is only twenty-four years old. With short blonde hair, a striking face, and eyes that are steeled in determination, it is almost hard to believe that this lethal weapon is simply from a farm in the small town of Stavanger. Ida Fløisvik is good at surprising people, and even better at submitting them. "My entire life is inside of JiuJitsu now," she says. "Because of this sport, I have the opportunity to travel and train all over the world." A black belt under Felipe Mota at Roger Gracie Academy, Ida, or "Xuxu" as she called, had only been training since she was 17 or 18 years old. She moved up quickly through the ranks due to her dedication and focused mindset. Xuxu was competing within 40 days of her first practice. For many, that's not even enough time to learn how to do a front roll properly. "I was a dancer before," Ida says. "But I won my first fight on an advantage, and I became addicted. All I cared about after that was JiuJitsu." Cheerful and friendly, Fløisvik originally was working in the nutrition shop that was underneath Mota's academy. Her future coach would come in occasionally to buy protein bars, and urged her to try out a class. She did, and the rest was history. A hard-working student, she came into the academy daily and would practice two to three times a day. Ida received her black belt on April 28, 2016, after six years of dedicated training. This made her only the second women to receive her black belt in Norway, and the first female black belt on the entire west coast of the country. She attributes this to her coach pushing her and supporting her to be a dominant athlete. "Felipe is a good competitor, and he has taught me so much on how to be a great coach," she affirms. "He supports all of us, and does his best to care for his students both on and off the mats. While it can be difficult for him to travel with me due to his obligations, we are always in touch. We text before my matches and he always has advice for me. I feel like he is my second father and I am lucky enough to be the godmother to his child." It would seem that Ida has an incredible support system. Close to academy owner Roger Gracie, she trusts that her coaches have her best interest in mind and are consistently looking out for her. In addition, she counts her family as her number-one fans. They stream her fights and watch online as she competes, so she knows that she is never alone. 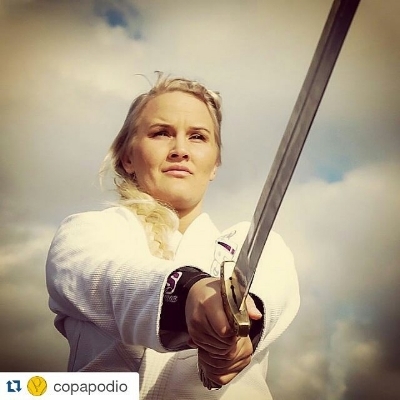 "Only about half the women who train JiuJitsu in Norway compete, so I don't do too many competitions at home. I fight more in Europe and around the world. In other places like Brazil, there are more women that train since JiuJitsu is so normal, but Norway is starting to catch on. I think people are realizing that this truly is a gentle art, and they will not get hurt if they try it." However, as a black belt, Ida is focusing on the next generation of fighters coming up. A head coach for the kids' classes for both beginner and advanced students, she invests herself in her students the same way she saw her coaches do for her. Fløisvik speaks highly of her team and establishes that she has a great group of high-level men and women with her. She also has guides for how she'd like to coach and train with them. "I want to be like Hannette Staack. She is a competitor that has made a road for female athletes like myself and trains hard. I've met her before and she is very humble. I look at her as example for how I'd like to present myself to other women. Another woman I look up to is my friend Shanti Abelha from Denmark. She has been supporting me since I was a white belt and has always made herself available for me. We were in the same weight class, and she told me, 'Now it is time to take over my weight class.' I think they are good role models and represent themselves in a great way. I want to inspire others in the same approach." With medals in elite tournaments such as Copa Podio, Pan-Ams, Rio Open, Rome Open, Europeans, World's, and the Abu Dhabi trials, it's suffice to say that Ida's champion-like behavior definitely encourages others. She credits JiuJitsu for pushing her to remain focused and to deal with difficult situations that arise. "I want to show other women that everyone can be something. I was a bigger girl when I first started, but training helped me to lose weight and get in shape. This motivated me because I was able to knock one challenge down. I was good in sports, but I was never the best in anything. I saw that I was good at this, and I wanted to continue. I'm such a competitive person that I'll even race others to eat the fastest. But it helps me stay motivated even during my hardest times." One way she can continue competing is by being sponsored by brands and businesses, because they can help pay for her travel, gear, and tournament fees, which can become expensive especially when it is outside of the country. Her sponsors Madla Naprapat, Luraklinikken, and Dr. Jeff Rosenberg support her now by providing her treatment and helping her prepare for or recover from fights. Another way is by forcing herself out of her comfort zone and venturing to new gyms, where she can learn different styles and push herself to be a better fighter. Most recently, Fløisvik spent several months training at Renzo Gracie Academy in New York City, and she intends to return when she can. "I think living in New York would be very good for me, because it is the biggest city in the world. You can get to anywhere from NYC. The best competitors are training in New York and the sport is growing very quickly there. It's easy to get around and I also have much more flexibility. Although I miss everyone back home dearly, now is my time to be selfish and focus on myself. My goal is to be a world champ in the gi, and I need to work hard to get there. Eventually, I'd like to have children and become a full-time coach. For now though, I have to go through these trials. There are days where my fingers are in pain, my hair is completely a mess, and I feel lonely. But this is how I become better. I have to push myself and remember that it is all worth it at the end." What motivates her to work so hard, especially when she is incredibly far from home? Sometimes in a country where they don't speak her first language or in a place where she doesn't know a single person? Ida has an answer ready. "No matter what, it is always going to be hard. All that matters is controlling your mind. If you're able to do that, then you can be whatever you want. Your mindset is the most important. If you are tired and you push yourself past it, then you are accomplishing that. When you tell yourself you can't--then you won't, and vice-versa. Once you become mentally strong on the mats, you'll find that you're mentally strong in life. We can only compete the way we train, so every single session, I leave it all out there. That is the only way I will become better, and I want to be the best."